Have we hit peak iPhone? It doesn’t really matter. There’s panic in the streets—well, make that on “the Street.” To listen to pundits and financial analysts talk, Apple is on the verge of becoming the next victim of Starkiller Base, exploding in a white-hot ball of plasma. iPhone sales appear to be flattening out, bringing tired pronouncements of Apple doom. Okay, first of all: deep breaths, everyone. Yes, the iPhone is a tremendously important part of Apple’s business, accounting for a little above two-thirds of its revenue. But a) it’s not the only part, b) those sales, while largely flat, are still not declining, and c) Apple still sold almost 75 million iPhones in the past quarter. Look, we’ve been down this road before. After the initial release of this quarter’s results, I found myself looking at a graph from MacStories, charting a four-quarter moving average of unit sales in Apple’s major product lines over the last fifteen years or so. 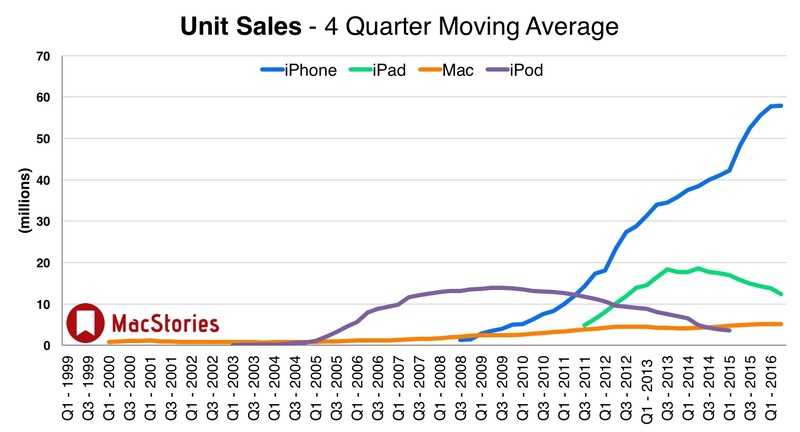 That includes the rise and fall of Apple’s previous blockbuster product, the iPod. But if you look at the curve of the iPod, you might also realize that the iPhone’s pattern is more or less the same, just on a much, much larger scale. So, will iPhone sales eventually plateau and decline? Absolutely. Have we already seen peak iPhone? That’s harder to say, but it’s not out of the question that this may be the apex. Even if iPhone sales have topped out, however, what’s key for Apple is making sure that whatever ramps up while the iPhone slows down is another Apple product. iPod sales, for example, hit their zenith in the first quarter of 2009, when they sold 22.7 million. That’s less than a third of the number of iPhones the company sold this past quarter, to be sure, but keep in mind that at that same time, Apple was only shipping 4.3 million iPhones. It’s not as though the iPhone sprang from Apple, fully formed like Athena from the head of Zeus, and immediately sold 75 million units. Whatever comes next is going to have a ramp up, just as the iPhone and iPod did before it. This is a game that Apple has played a few times during its almost 40-year history. 1 In the company’s early years, its secret sauce was its software, especially its operating system. That’s a product that the company gives away today—it’s not even broken out in revenue statements anymore, because as important as it is to the company’s ecosystem and installed base 2, it’s not the business that it was back in the 1980s. Apple knows how to adapt to a changing market, especially one that moves as fast as technology. There may be missteps along the way—based on the current trajectory of the iPad’s sales, I don’t think it’s ever going to be as enormously successful as Apple, and especially the late Steve Jobs, thought it would be. Hell, it’s more than possible that no future Apple product will ever match the sales curve of the iPhone. If Apple comes out with its much-ballyhooed electric car, does anyone think the company will sell 75 million of them? The century-old GM set a sales record by selling 9.8 million cars in all of 2015—and, if anything, it’s more akin to the Android of automobiles. Apple’s never gone for volume, and if it did move into the market, it would likely sell many fewer cars.